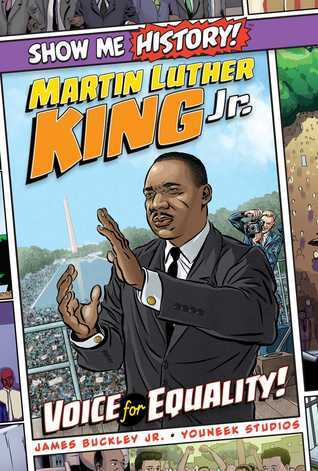 Graphic Novel Review: Martin Luther King, Jr. This graphic novel wonderfully summarizes the powerful life story of Martin Luther King, Jr. and his peaceful fight for civil rights in the United States. I especially liked that many exact quotes from MLK, Jr. and others are used as the dialogue, but some of the dialogue is conjecture and added to enhance the story, imagining what might have been said in various situations. I’m always on the lookout for reputable historical books, and I felt that the history here was accurate and true to actual events. I really liked the cartoon art style, but felt like it could have been a little more polished. However, the colors are vibrant, and the illustrations really show the emotions of the people, bringing the reader right into the history of the time, and making it real. Each panel has an emotional charge and a good sense of action that pushes the story forward. I thought it was a nice touch to have a glossary in the back of the book for younger readers who are still building their vocabulary. I would recommend this graphic novel to readers aged 7-17.